Sir Lawrence Alma-Tadema (Born in 1836) was born in an artistic family. His mother was an artist and she instructed her children’s teacher incorporate drawing lessons into their education. He received his first training in art from a local drawing master who was hired to teach his older half-brothers. Alma-Tadema was born in the small village of Dronrijp, in Friesland, Netherlands. His father died when he was only 4, leaving him under the care of his mother together with his 4 siblings. By the time of his father’s death, the family had moved to the town of Leeuwarden. 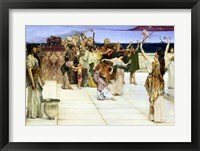 It was Alma-Tadema’s mother intention that the boy would become a lawyer. However, in 1851, he was diagnosed as consumptive after he suffered mental and physical breakdown. The doctors gave him only a short time to live; he was allowed to spend his remaining days at his leisure, painting and drawing. Left on his own to do what he liked, Alma-Tadema regained his health and decided to pursue art as a career. He entered The Royal Academy of Antwerp in 1852 and studied under Charles Egide Gustave. He studied early Flemish and Dutch art for four year during which time, he won several respectable awards. After his graduation, he set out into the art industry with gusto. In 1872 he organized his paintings into an identification system by assigning his earlier pictures numbers and including an opus number under his signature as well. 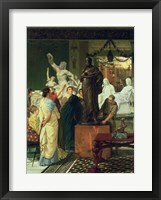 Framed Sir Lawrence Alma-Tadema art is in great demand and are stocked by many collectors around the world.